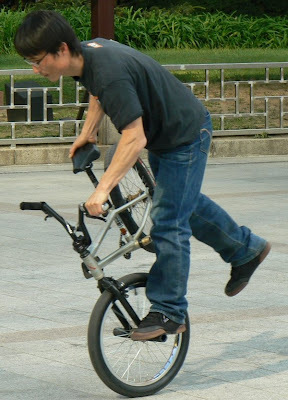 No, not rhyming-slang for psychiatrist, but one of the members of a group of young guys going bicycle tricks in front of Bosingak. 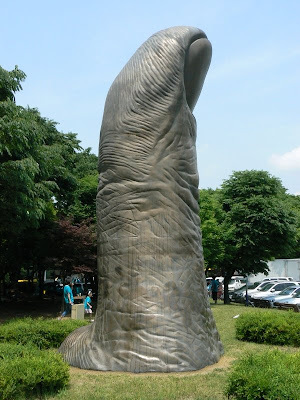 This is just one of the many unusual sculptures at the Seoul Olympic Park complex. I will feature some more of these in future posts. The folks in the blue shirts give some idea of the scale of this particular piece. 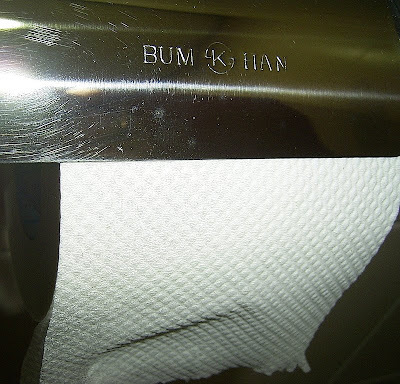 I know about Genghis Khan and his son Kublai Khan, but I was unaware of the great "Bum Khan". That was until I happened to look closely at the top of the toilet paper dispenser in a cubicle I needed to visit recently. I assume that the association of the name with the purpose of the toilet tissue is just an unfortunate coincidence, but nevertheless I found it amusing. Fortunately (?) I happened to have my camera in my bag. I suspect that the flash going off in my cubicle provided food for thought for the folks in the other cubicles. To complete the theme of toilet humour for this entry, I saw a young Korean woman in the supermarket recently wearing a t-shirt that had the following text written on the front without an accompanying image (those offended easily should not read any further): "MY CAT SMELLS OF RAT PISS". 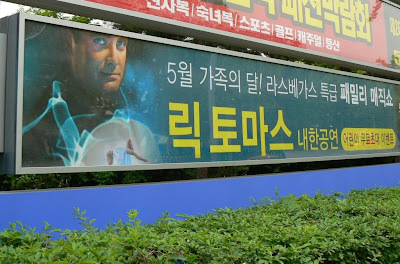 I have no idea what this means and neither do my Korean friends. I am told that a lot of young Koreans like to wear clothing with English words on them without necessarily understanding what those words actually mean. I suspect that the young woman I saw fell into this category. 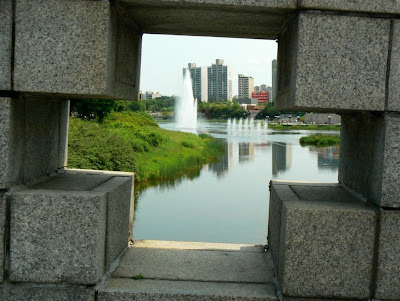 Looking across the Mong Chon Fortress moat at Seoul Olympic Park. Although once a defensive feature of the fortress, the moat, and surrounding park, is now a beautiful place to ride a bike, go for a walk or have a picnic. This shot was taken of the fountains in the moat through one of the openings in the Gommal Bridge. 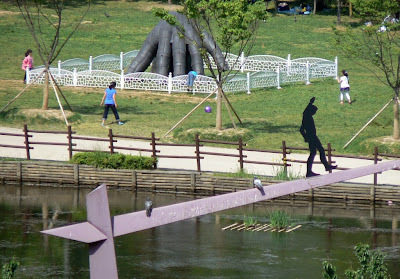 I have commented previously in this blog about the bridges across the Han River and threatened to post photos of more of them. Well, today we have the Dongho rail/road bridge at Oksu. This photo is taken from the northern (Oksu subway station) end, looking roughly south-east. 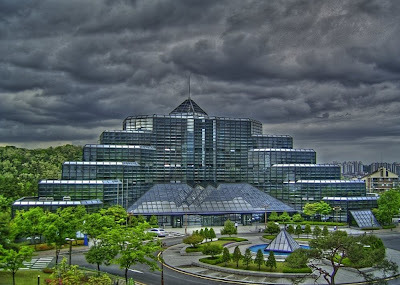 The image above is a tone-mapped composite of three separate exposures I took of the so called "Incubator" building on the grounds of SNU Research Park, Kwanak-gu. This painting-like effect makes the already unusual structure look even more surreal, particularly as a storm approaches. 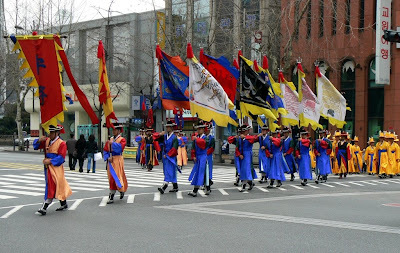 I have seen the changing of the guard ceremony at the Deoksu and Gyeongbok palaces several times, but this was the first time that I had seen the guards and musicians parading through downtown Seoul. At periodic intervals the musicians would begin to play (loudly), while marching, which made the parade even more stirring. 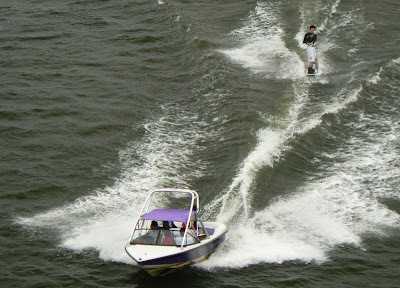 When I first saw this guy on the Han River I thought that he was water skiing with a single single ski. When he got closer I could see he was on what looked more like a snowboard (a wakeboard?). I watched him for quite a while and he seemed to spend more time in the water than on it. Looking across TapGol Park towards the Wongaksa 10 level stone pagoda (National Treasure No. 2). The pagoda was constructed in the 1460s but is now enclosed in a large glass case to protect it from weathering and further damage. A close up of some of the detail on the pagoda can be seen here. 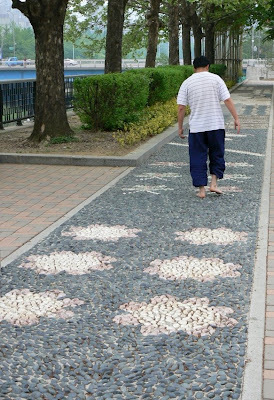 A man walks along a specially constructed path designed to massage one's feet. These paths are in many parks around Seoul. This one is in the grounds of Olympic Park. A series of posters on a community notice board in Ichon. 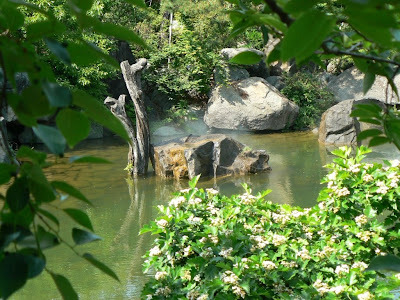 This pretty little spot is called Dragon Falls and is on the grounds of the National Museum of Korea. Yongsan Family Park, Near Ichon subway station and next to the National Museum of Korea, is a great place for a picnic. This shot was taken from the pedestrian overpass over the railway line. A group of dancers launch a colleague into the air as part of a performance in the Saturday Family Concert series at the National Museum of Korea, Yongsan. A Korean magpie at Seoul Olympic Park. 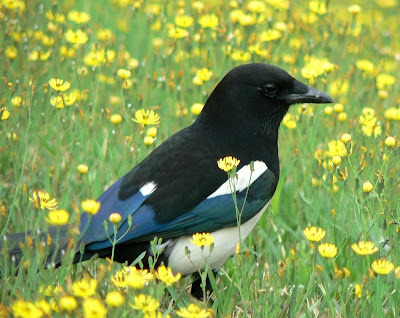 A couple of years back scientists from the Veterinary Research and Quarantine Service at Anyang detected the presence of the H5N1 type of the highly pathogenic avian influenza (HPAI) virus in dead Korean magpies. Given that there is currently a significant outbreak of avian influenza in South Korea, perhaps it pays to admire these birds from a distance. 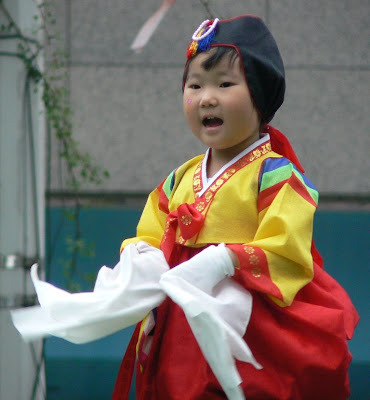 A young girl in traditional dress dances as part of a performance during the Lotus Lantern Festival. I took this photo on the north-eastern side of the Hangang Bridge on the weekend. Although the many signs in the foreground and background at the top of the shot were what caught my eye, it wasn't until I got home that I realised there were actually a lot more there than I had first thought. How many can you see? 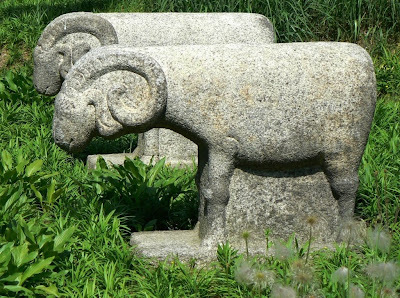 Two stone-faced sheep on the grounds of the National Museum of Korea, Yongsan. A photographer's eye view of a performance by dancers at the Lotus Lantern Festival. 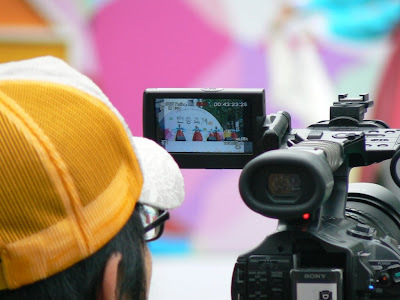 As I was having trouble getting a clear shot of the stage where the dancers were performing I thought that I might as well take a shot of what he was filming. Today is Buddha's Birthday and thus is a public holiday here in Korea. 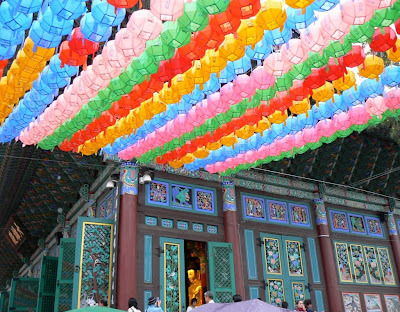 This photo was taken at the Jogye-sa Buddhist Temple and shows the colourful lanterns that appear everywhere in the lead up to this event. 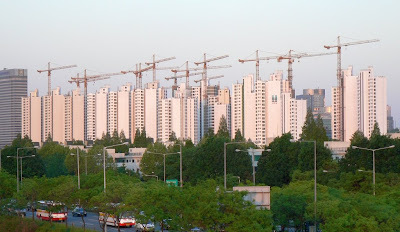 A cluster of new apartments under construction just south of the Han River. 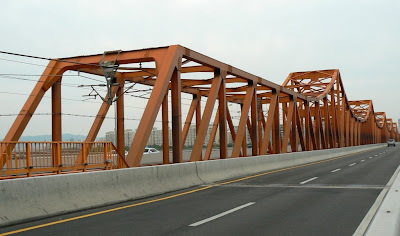 The photo was taken looking to the east from the bridge at Dongjak. While walking along the earthen wall of the Mong Chon Fortress (Historic Site No. 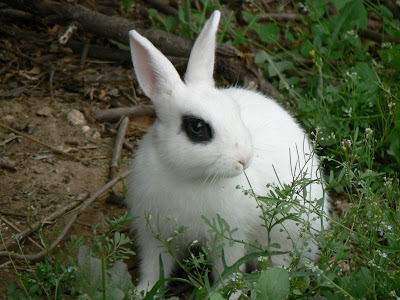 207) at Seoul Olympic Park I came across this little guy happily munching on the greenery. 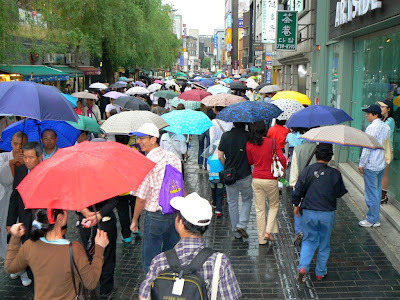 With a few drops of rain, Insadong is almost instantly transformed into a sea of umbrellas. 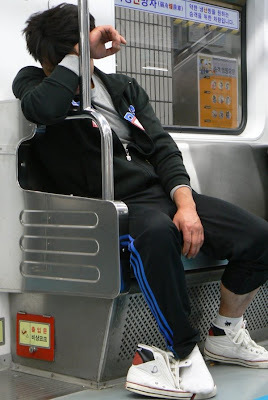 I boarded an early train at Samgakji subway station recently and found this gentleman fast asleep. I am amazed by the number of passengers sleeping on trains, particularly early in the morning; I also wonder how many of them miss their stops and have to double-back. 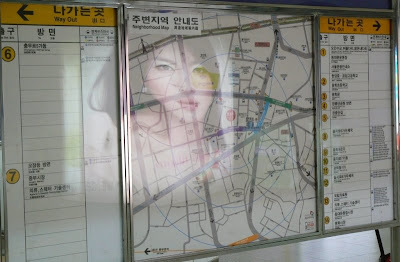 A photo of a Neighborhood Map at Dongdaemun subway station with the reflected image of an illuminated advertising poster. On Saturday evening we went to see the Rick Thomas magic show out at Olympic Park. He performed many classic stage illusions, some with new twists, and a couple that left us wondering "how on earth did he do that". No tigers on this tour but, with an amusing support act (a magician/clown), beautiful show-girls and a leggy assistant, it was an entertaining night out. 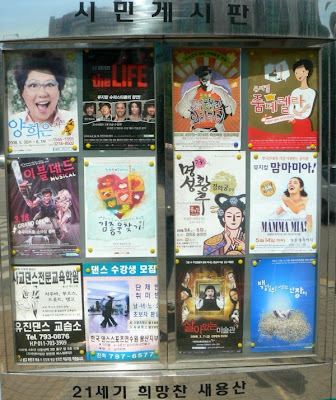 The photo above shows the poster advertising the show. Now an old joke (like me) that my father used to tell, which goes something like this: "I am a bit of a magician myself; many times on a long drive I'll suddenly turn into a petrol-station". 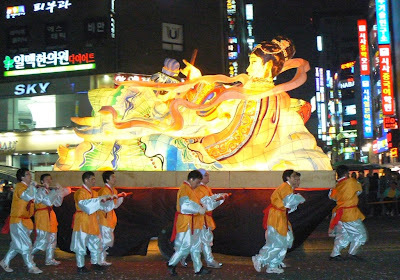 Last night we went to the Lantern Parade in Jongno in the heart of downtown Seoul. It is run as part of the Lotus Lantern Festival leading up to Buddha's birthday on May 12. Thousands of performers in colourful traditional costumes paraded carrying basketball-sized lanterns while giant lanterns were driven on the backs of vehicles or pushed along as in the photo above. 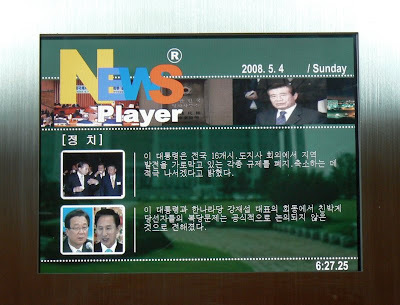 The elevator in my apartment building has a little video screen inside above the door that displays news announcements, the day, date and time. As you can see from the time stamp in the bottom right of the shot, I was off early this morning to take more photographs around Seoul. 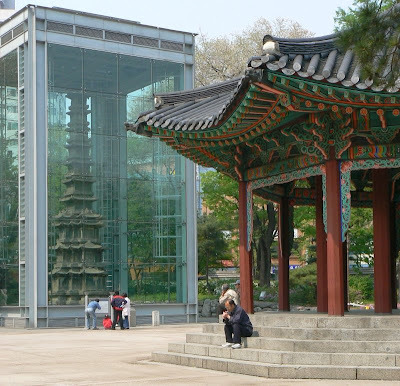 Two well dressed ajumeoni with the main hall (Junghwajeon) of Deoksu Palace behind. 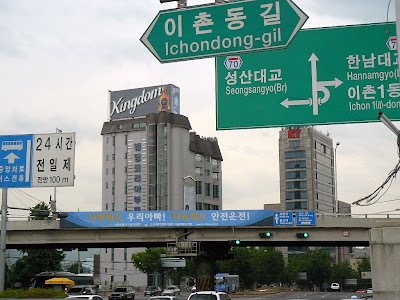 According to Wikipedia, Konglish is the use of English words (or words derived from English words) in a Korean context. I think that the description on this packet of a kind of pastry qualifies as such (you will probably have to click on the photo to go to the larger image to see the words clearly). As an Australian, I find the reference to the koala highly amusing. A former Minister for Tourism in the Australian Government, Mr John Brown, once described the Koala as "a piddling, stinking creature that wees on you". 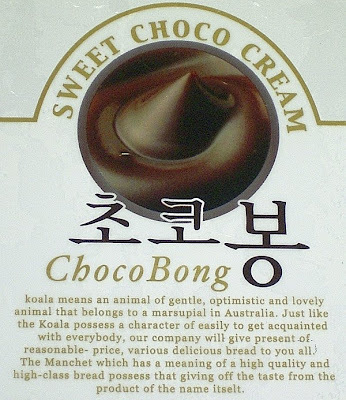 Certainly not the image I'd like to have as I am about to chow down on a Choco Bong! 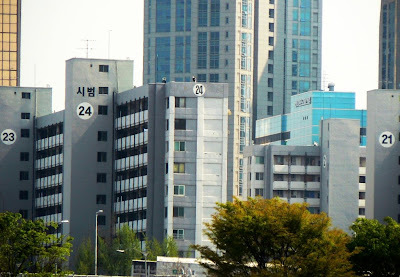 My Theme Day photo is of some numbered apartment buildings near the 63 building (another numbered landmark in Seoul) on Yeouido Island. There are actually five numbers in the shot; can you spot them all?